The saying that little boys play with little toys and big boys play with big toys may not always be true. When it comes to miniature tractor collecting, big boys often play with little toys. And, judging by how quickly farm-machinery dealers and toy tractor retailers sell out their new models, grown-ups take their hobby seriously.Model tractor enthusiasts come from a wide cross-section of the population but it is probably fair to say that retired farmers make up a good proportion of miniature tractor aficionados. As youngsters, most farm boys played with a toy tractor "just like dad's" or, at least, they imagined that their prized toy was a miniature version of the real one that their dad used on the family farm. After growing up, these youngsters may have pursued a variety of careers but most will have memories of the happy hours they spent playing with their farm machinery toys. Now, years later, a toy display in a department store window, or perhaps an illustration in a sales catalogue, may have rekindled those long-ago memories and another model tractor enthusiast is added to the fold. Charlie, a retired farmer whose family farmed in the Mildred area near Prince Albert, Saskatchewan, in the 1920s and 1930s became interested in model tractors when he saw a model of a tractor he once owned. "I just had to have it," he says. Sometime after that first acquisition, he saw a miniature of an even older tractor that he remembered his father owning at one time. He bought it as well. "Then I remembered the toy tractors that our own boys used to play with when they were youngsters in the 1950s," explains the father of three. "Some of our boys' toy tractors were still around the house long after they had married and left home. Although those well-worn toys were somewhat the worse for wear, for the most part they were in good shape," recalls Charlie. "They have now all been restored and added to my collection." Since the collecting bug bit this septuagenarian after retiring from active farming several years ago, his tractor accumulation has mushroomed and grown to more than 300 models. Many are scaled 1:16 which means that they range from about 8 to 12 inches in length depending on the size of the actual tractor. "They are large enough to show the desired detailing that most collectors want but not so large as to take up an inordinate amount of space." Ytorage space for serious collectors such as Charlie is an obvious consideration. Fortunately, he has a large basement. And much of it is dedicated to the various aspects of his hobby. Repairing, restoring, and even rebuilding some models, play an important part in his overall collecting pursuits and he has set aside a part of his basement as a "workshop." For major rebuilding and restoration work that require repainting, drying the enamel paint is the final step and his wife reluctantly lets him use the oven in her kitchen stove he concedes. All his tractors are attractively displayed in glass cases that Charlie built himself. "They cost a fraction of what I would have had to pay if I had purchased them fully assembled," he explains. Because each model from the collection is on display, Charlie had to find a place to store the boxes they came in. He solved that problem by stacking them under the staircase leading down to the basement. Because miniatures that still have their original boxes are more desirable than those without them, it is important that boxes be stored away as carefully as the models themselves. The intrinsic value of Charlie's miniature tractors, as is true for all collectible models, is in their ability to communicate the visual aspects of full-sized, real machines. They must remind collectors of a time, place, or other event that evoke an emotion that has special meaning for the collector. Charlie's miniatures do that. That die-cast model of Charlie's own first real tractor set the stage that led this retiree on a journey that has given him years of enjoyment and meaningful activity. Not everyone can, or would necessarily want to, pursue a collectible hobby as intensively as individuals who have the leisure time that only comes with retirement from the work force. For that reason it becomes necessary to collect selectively or specialize. For collectors with deep pockets, for example, one way to collect is to pursue only cast-iron models that toy manufacturers began to produce in the early 1920s. Unfortunately, the 1940s war years brought an end to their manufacture when the companies that built them converted their factories to produce items for the war effort. One of the best-known cast-iron farm toy manufacturers was the Arcade Company; others were Dent, Hubley, Kenton, and, of course, Vindex. There are other ways to specialize in miniature tractor collecting: one is by product name. Many individuals are familiar with the instantly recognized "John Deere" yellow and green colours. Most everyone has, at some time or other, seen this farm machinery manufacture's well-known slogan: "Nothing Runs Like a Deere." Reproducing colours on models as close as possible to the original machines is as important as the accuracy of the casting details. John Deere's first commercial product, perhaps somewhat surprisingly, was not a tractor but a plough. The company founder, John Deere, built and assembled it in his blacksmith shop in 1837. For the first mass-produced farm tractors we turn to Henry Ford and the Fordson tractor. A man by the name of W. Baer Ewing of Minneapolis, Minnesota, founded a company called the Ford Tractor Company to capitalize on the name of automaker Henry Ford who was at the time also heavily involved in tractor research, technology, and manufacture alongside his motor car business. Because Ford did not own the rights to his own name for his farm tractor operation, he used the name Fordson after his auto company name Ford and Sons. Besides being used for farming purposes, the early Fordson tractors were also used in road construction and in other non-farm operations such as providing power in industrial settings. Perhaps because the Ford name was better known than the names of other tractor manufacturers of that era, more of these models were produced and surviving cast-iron Fordson miniatures exceed other makes by a substantial number. Yet, despite the number still in existence, they are not available at bargain prices. Arcade was another important manufacturer of cast-iron toys as were, to a lesser extent, Hubley, Kenton, Killgore, and perhaps others. Cast-iron Fordson models, in a number of different colours, exist with smooth steel wheels, cleated wheels, and wheels fitted with rubber-tires. After Ford introduced his Fordson tractor into the British Isles, toy companies there were not long in creating miniature models. Best known of the overseas companies building Fordson models (later changing the name to Ford) are Dinky, Corgi, and Britains. Also dating back to the 1920s are the International Harvester cast-iron models. The Arcade company manufactured I.H. miniatures under the McCormick-Deering name. With the conversion to a war-time economy in the 1940s, production of the International Harvester cast-iron miniatures came to an end. Following the war, die-cast models replaced the cast iron miniatures with the Ertl Company emerging as the chief manufacturer of farm machinery toys and I.H. became one of Ertl's largest customers. Massey-Ferguson came into being when Massey-Harris and Ferguson merged about 50 years ago. The now well-established company has an extensive stock of model tractors to its credit. "Really good detailing" is how Charlie describes some of the models produced for Ferguson. Miniature replicas, of course, also exist for the various tractors built for Massey-Ferguson as well as for its forerunner, the Massey-Harris company. A Canadian toy manufacturing company that turned out some noteworthy Massey-Harris models is Lincoln Toys of Canada. It was headquartered in Windsor, Ontario, until the company vacated the toy business many years ago. Another tractor manufacturer whose cast iron models date back to the 1920 is J. I. Case. Its model "L" cast-iron tractor is probably the company's best known although it was not produced in anywhere near the quantity that, let us say, the Fordson miniatures enjoyed. It is for that very reason that they are now aggressively sought-after by collectors. There was a lull in the production of Case miniatures after the cast-iron models stopped being produced during the 1940-45 war years but Case miniatures resurfaced with the introduction of the 1:16 models built by Monarch. Since the 1960s, the Ertl Company has been manufacturing the J.I. Case die-cast models. Collectors of cast-iron models have more choice when it comes to Allis Chalmers. The Arcade Manufacturing Company produced cast-iron models in three different scales. Dent or Hubley, the available information is not clear, also manufactured a class of cast-iron Allis Chalmers. Miniatures of the various Allis Chalmers lines proliferated with the demise of its cast-iron models. Collectors can avail themselves of models of the company's series "C" built by American Precision Products, and the HD-5 crawler models by Product Miniature. There are even plastic models of Allis Chalmers' WD-45 and D series tractors manufactured by the Strombecker company. 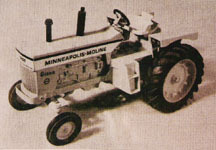 Cockshutt, Minneapolis-Moline, and Oliver tractor companies, all eventually falling under the controlling interest of White Motors Inc., each had miniature models of their various lines produced by a number of different toy manufacturers including Arcade, Slik Toy, Lincoln Toy and, most recently, Ertl. Of special interest to collectors are the wooden models of tractors manufactured during the World War II years when strategic metals were available only for war-related products. Although quite crude when compared to cast-iron and die-cast miniatures these wooden models provide collectors with an interesting sideline for their hobby. Another area of specialization is by model size. Although 1:16 models seem to be the most popular with today's collectors, there are many other scales to choose from. A scale of 1:87 is probably the smallest recommended size if the details of the tractor's features are important to the collector. Anything smaller that a 1:100 scale is so small that details become nearly meaningless: larger than 1:12, on the other hand, probably are too large for most collectors. For example, a typical 1:12 tractor model measures about 18 inches in length whereas a 1:100 scale would reduce the model to just over 2 inches in length, a size that is obviously too small to allow for any meaningful detail to be shown. Another area of specialization is by era. 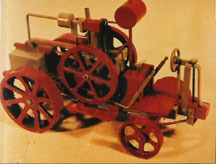 Many enthusiasts became collectors when they see a model of a tractor that they, or someone they have known, may have owned. For instance, enthusiasts familiar with tractors dating from the 1950s or 1960s are likely to concentrate on models from that era. Collecting by type of construction is another way to specialize. Because cast-iron miniatures are scarce and comparatively expensive, they might not be the first choice for every collector. Fortunately, there are alternatives that are either more affordable, more readily obtainable, or both. Some of the most attractive miniatures are die-cast models. They are also priced within the reach of most collectors. Better still, all major tractor lines have been reproduced as die-cast models. Plastic kits, although not as popular as they were at one time, provide another avenue for collectors to add specific models that may not be available in cast-iron, die-cast, or wood-carved models. Although specialization makes sense for many collectors, it is not the only way that collectible hobbies can be enjoyed. Charlie, for instance, owns representative models from many periods and from nearly all makes manufactured in North America. But even his extensive collection cannot encompass every tractor series that has ever been produced. And there is no need to. "Collect what you like," is a good motto that this inveterate collector follows. What most collectors look for in miniatures are realistic, detailed features. It is that life-like look that attracts collectors to the hobby. For instance, to give their models an added touch of authenticity, some of International Harvester's models include the removable drawbars that allows implements such as planters, disks, or ploughs, to be attached to form a single integrated unit. Other models feature a variety of hitches that allow tractors to pull the various implements and machinery for which they were designed. Some of the later tractor models, such as Ertl's International 1086, reproduced the safety cabs found on working tractors that have made farming a much safer occupation, to say nothing of providing a more comfortable working environment for operators. Some of these glass-enclosed cabs on full-sized tractors are equipped with air conditioning and stereophonic music to make the working life of a modern farmer something very different from that of his predecessor of even fifty years ago. Quality miniatures also include dual rear wheels, front-end weight brackets, and four-wheel drive where these features exist on their life-sized counterparts. For beginners, who have decided to specialize by manufacturer, a good place to start their collection is at their local farm machinery dealer. Most will stock a supply of representative models of the full-sized tractors that they sell. Another good place to look for miniatures is at farm supply centres found in most towns. For collectors looking for a wider selection, department, discount, toy, and even some variety stores may have some of the current models. For older models, the search becomes more of a challenge. Toy and antique shows, and to a lesser extent, hobby shops, are obvious places to look for obsolete models. As with most other collectible items, the cultivation (no pun intended) of a good relationship with antique dealers can be helpful. Once a dealer with whom a trusting business relationship has been established knows what items their clients are looking for they will be on the lookout for, and in time may well find, that pièce de résistance. Other sources to explore for those elusive models are church bazaars, flea markets, garage and rummage sales, surplus stores, and for the truly dedicated enthusiasts, a door-to-door canvass. Not long ago, a gentleman came to my door enquiring if I had any old cameras or portable typewriters that I wanted to sell. Although I had neither I learned, after a brief conversation, that he was also interested in all manner of other collectible items and I was able to unload some postcards that I was no longer interested in. He was apparently networking with other collectibles dealers and he admitted that, although going door-to-door was time-consuming, it paid off in unexpected ways. From time to time it turned up desirable items long forgotten in some basement or attic. While collecting miniature tractors is a long-established, mature, hobby it has not reached the stage where it has ceased expanding and attracting new collectors, both young and old. It may be true that the difference between little boys and big boys are the size of their toys but when it comes to farm machinery models, both are equally enamoured with the hobby. While youngsters perceive their toy tractors as something to play with, their elders appreciate models on another level: they see in these miniature recreations a detail of workmanship that transcends the generally accepted definition of toys. For some it evokes a nostalgic memory of another place and time. Perhaps, in the final analysis, model tractor collecting can best be described as a pastime for the young and for the young at heart.